Wealthy Moldovan businessman and politician Vladimir Plahotniuc and the family of former President Vladimir Voronin are connected in an offshore company controlled by the NIT TV channel. RISE Moldova reporters found documents that show that a minister, a deputy minister, and the speaker of Parliament have all been involved in Plahotniuc’s businesses. The Moldovan TV channel NIT was launched in 1997 by New Ideas Television Ltd., and for nearly 20 years its major shareholders were hidden in companies registered in offshore tax havens. The people who really own New Ideas transacted their business through “proxies” – close associates who acted on their behalf, with the legal right to sign contracts or buy and sell shares in Moldova and, sometimes, abroad. The group included some well-known names, among them the current Deputy Minister of Economy, Vitalie Iurcu; Igor Anglicev, a board member at Fincombank who is close to the family of former President Vladimir Voronin; and Sergei Noscov, long associated with Vladimir Plahotniuc, an influential politician and wealthy businessman with a number of enterprises. Noscov, 65, is a key person in the administration of businesses controlled by Plahotniuc. Although the TV channel was shuttered in 2012 when its license was revoked, New Ideas Television Ltd. is still active. 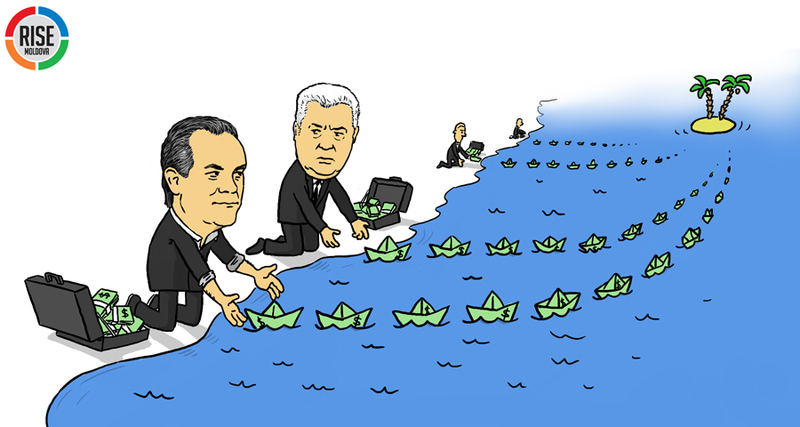 The connections between Plahotniuc and the group of associates who have acted as his proxies in Moldova are buried in the records of corporations founded as much as a decade ago in offshore tax havens. While some of this information was known previously, additional details have emerged in the Panama Papers, a trove of 11.5 million documents leaked from the Panamanian law firm Mossack Foneseca that was shared with more than 100 media groups worldwide, including RISE Moldva. On the same day that Advac Associates was established, BVI lawyers issued a general power of attorney designating Noscov its Moldovan representative, the person authorized to act for Advac. This document gives Noscov the right to establish other companies worldwide and to name other individuals to handle individual transactions. Aug. 25, 2006. World Group Assets Ltd. (BVI) is the majority shareholder at NIT (Details, HERE). It is represented by current Deputy Minister of Economy Vitalie Iurcu, who transfers ownership of NIT to Advac Associates Ltd. Subsequently, Noscov extends a power of attorney to Iurcu so that he, too, can act on Advac’s behalf. Aug. 1, 2008. Iurcu buys equipment for the NIT channel. Aug. 6, 2009. Noscov empowers Igor Anglicev to represent Advac’s interests. Anglicev is close to the family of former president Voronin and serves on the board of Fincombank with Voronin’s son. June 4, 2010. Belgian citizen Antonius Spee, who appears to be yet another proxy, is named as the sole owner of Advac Associates Ltd. (Details, HERE), canceling the power of attorney for Noscov, which means that the power of attorney for Anglicev is automatically canceled too. For several years NIT continued as an online news portal, but as of 2015, the website ceased to operate. However, New Ideas Television Ltd. wasn’t liquidated. It has a registered capital of 12.7 million lei (US$ 645,000) and owns several buildings in Moldova. New Ideas Television Ltd. also holds shares in 6 companies: TV studio Tele Bastina Ltd.; Radio-Delta Ltd.; advertising agency Aleon Ltd.; daily Russian-language newspaper, Independent Moldova Ltd.; the Basa-Press news agency and Mefinco Ltd. In recent years, some of these companies went out of business. Iurcu, the deputy Minister of Economy, was not the only official who played a role in offshore companies that ultimately connect to Plahotniuc. For one month in 2010, Information Technology and Communications Minister Vasile Botnari served as manager of the security company Argus-S, which documents show is controlled by Plahotniuc. Botnari was appointed to this position by Noscov. In addition, the current Parliamentary Speaker, Andrian Candu, represented the Dutch OTIV Prime Hospitality BV company that controls Nobil Club Ltd., one of the most prosperous businesses linked to Plahotniuc’s name. And Noscov was the key to transactions between companies that controlled Nobil Club in turn. Between 2006 and 2009, Noscov was the majority shareholder of NIT and of its eventual owner, the offshore company Advac Associates Ltd. According to the Nobil Club company history, in 2009 Noscov sold Nobil to the Belize company Entertainment & Publicity Investment Ltd., represented by Salinski. Noscov didn’t leave the company but changed his role, from owner to proxy. Noscov then did two things on behalf of Entertainment & Publicity Investment Ltd. In December of 2010, he transferred ownership of the Nobil Club firm to OTIV Prime Hospitality BV, a Netherlands company represented by Candu, the current speaker of the Parliament. Entertainment & Publicity Investment Ltd. also owns the advertising agency Angel-S, and Noscov signed the sales contract when Angel-S was acquired by the American company Media Resources LLC, which then sold the agency to Candu’s OTIV Prime Media Agency BV. Another company affiliated with Plahotniuc that lists Noscov is the Security Agency Argus-S. The company was created in 2007 and two years later Noscov became the sole shareholder. In June 2010, he appointed Botnari, current Minister of Information Technology and Communications, as manager of the security company. A month later, Botnari was replaced by another manager, and ownership of the Argus-S is transferred to the American company Power Investment LLC, represented by Cristina Balan (Details, HERE), another proxy in Plahotniuc businesses. 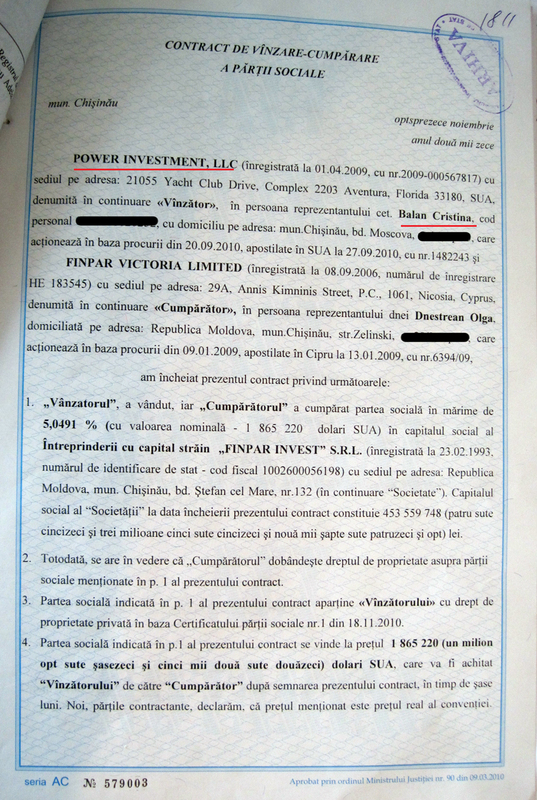 In fact, in 2010, Power Investment LLC had shares in Finpar Invest Ltd., another company connected directly to Plahotniuc through his wife and sister. Vitalie IURCU, 44. Between 2006 and 2009 Iurcu represented two offshore companies connected to the NIT channel: World Group Assets Ltd. and Advac Associates Ltd. The latter was represented by Iurcu when he was director general of the National Energy Regulatory Agency from 2007-2009. Iurcu’s resume says that from 2009 to 2015 he was general director of Moldtelecom, once the state telecom but now a joint stock company owned by the state. Since August 2015, Iurcu has been Deputy Minister of Economy. Iurcu and Candu are members of the Board of Directors of the Association of Businessmen from Moldova, an organization founded and led by Plahotniuc. Igor ANGLICEV. From 2009 to 2015 he represented Advac Associates Ltd. (Details, HERE). Anglicev is connected to family businesses of the former President of Moldova, Vladimir Voronin. For several years, Anglicev has been a member of the Management Board of Fincombank. In The chairman of the bank’s board is Oleg Voronin, the former president’s son. The Voronin family is also a Fincombank shareholder, holding 20.09 percent.